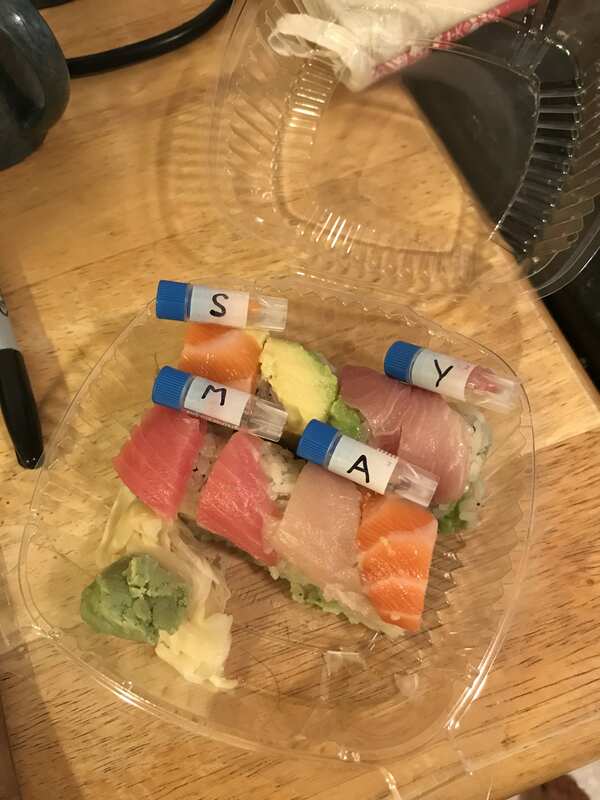 For this weeks lab on DNA barcoding fish, I got my samples off a rainbow roll from Yuubi on Balboa on the evening of Sep 4. I refrigerated the samples until using them in lab the next day. 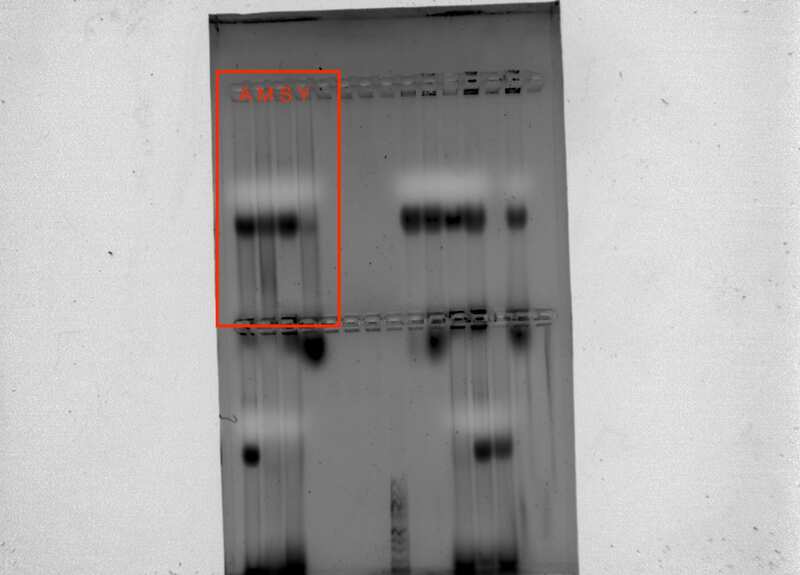 I labelled a new set of tubes for DNA extraction, keeping the original letters but adding my initials for more specificity: AJC-A, AJC-M, AJC-S, AJC-Y. From my original sample of albacore, I cut a piece to 2mg and placed it in the appropriate microcentrifuge tube. For the three other fish, I cut smaller samples approximating the size of the albacore sample, attempting to keep it between 2 and 10 mg. Between cutting each piece, I cleaned the tools with 70% ethanol. Note: My yellowtail sample (AJC-Y) was covered in avocado, and I had difficulty fully cleaning it. – Add 100µl of extraction solution to each tube. – Add 25µl of tissue preparation solution to each tube. – Let the samples incubate at room temperature for 10 minutes. – Incubate the samples at 95ºC for exactly 3 minutes. – Add 100µl of neutralizing solution and vortex briefly. – Place on ice until you are ready for the next step. Though running our extracted DNA through a gel is not necessary for barcoding, we did this to get a visual of our extraction and check how well it went. 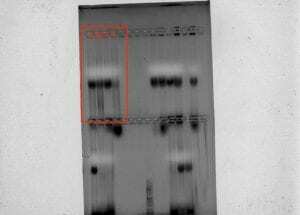 Since we were extracting genomic DNA, we expected to see a smear of bars on the finished gel. Prof. Paul had prepared gels and poured 1xTAE buffer into the box already, so we just needed to prep and load are samples into the gels and run them. – On a piece of parafilm, mix 2µl of loading dye with 3µl of each genomic DNA solution separately. For me, this meant four 5µl dots of loading dye and DNA solution. Awesome Possums’ Gel Image. My samples are in the top left inside the red box. From left to right, the samples are AJC-A, AJC-M, AJC-S, and AJC-Y. As you can see in the image above, there are smears for each row so the extraction appeared to be successful. My extraction for salmon (AJC-S) was noticeably lighter than the others, though still usable. We then amplified our DNA using PCR. First, I prepped a Master Mix of the solution we added to our gDNA samples. Using a Master mix means all samples receive the same amount of each solution, so there is less room for error. Note: Our table had 16 samples totaled, so we multiplied the above by 22 to make enough master mix for all of us. We then diluted our DNA samples, since too high of concentrations impede amplification. The ratio was 1:10, so we mixed 2µl of each sample of extracted DNA with 18µl purified water in new microcentrifuge tubes, then flicked the tube to mix it. In the PCR tubes, we mixed each of our samples with the master mix. I added 2µl of each diluted DNA sample, then 18µl of the Master Mix. Once each tube was labeled and filled appropriately, I placed it in the thermocycler. The first step allows for the initial denaturing. The following 30 cycles allow for denaturing, annealing, and extension. That is followed by the final extension at 72ºC for 10 min. Then the machine will hold the samples at a constant 10ºC.